The Euro Video Challenge is a video competition for young people aged between 18 and 30. The goal is to explain an economic topic related to the ECB’s activities in a simple and entertaining format. The winners of the Euro Video Challenge were announced at the award ceremony in Lyon (France) on Thursday, 9 November 2017 – at the 10th anniversary of the economics conference “Les Journées de l’économie” (Jéco). Watch the highlights of the award ceremony and hear from the finalists of the Euro Video Challenge. The first-place "Bitcoin, money of the future?" was produced by Jason Halbgewachs and Michiel van Aarnhem. They received a prize of €4,000. Second prize (€3,000) went to Marina Quenan for "Faut-il avoir confiance dans sa monnaie ?". You can also watch the videos produced by the other finalists, Vid Kregar (“Market ninjas, inflation and euroman”) and Théo Petrignet and Jules Marie (“La BCE doit-elle aider les États en difficultés ?”). 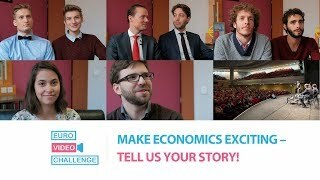 We asked those of you aged between 18 and 30 to submit a video on an economics topic related to the ECB’s work in the time period from 6 July to 24 September 2017. The challenge was to create a short film that is engaging and easy to understand, suitable for a young audience with perhaps no previous knowledge of the subject. An original video (no longer than 2 minutes 20 seconds) had to be submitted together with the corresponding script. Our thanks to all participants!